Virginia & Truckee express car No. 14 and its sister, baggage-mail car No. 13, were built in 1874 by the Oxford Cooperative Car Co. of Oxford, Pennsylvania. Along with Brill coaches Nos. 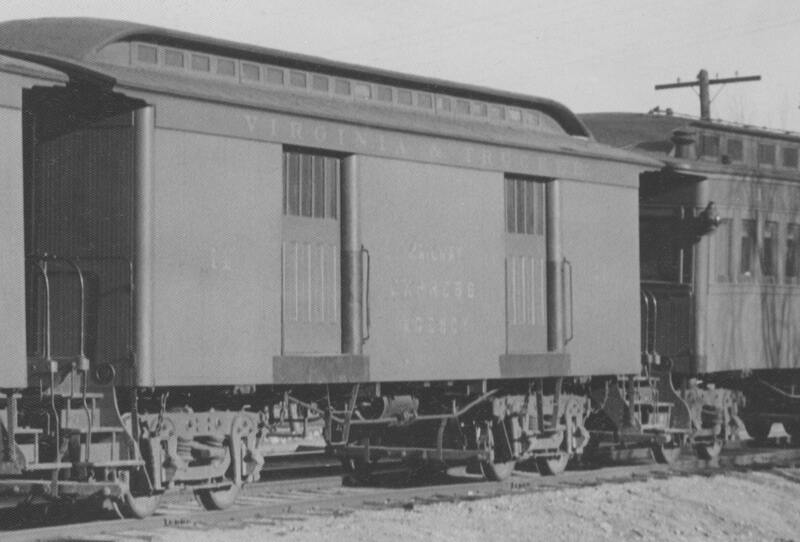 11 and 12, they were part of the "Philadelphia Train", placed in service by the V&T to alternate with the earlier Kimball train as the Lightening Express between Reno and Virginia City. Express car No. 14 saw years of service hauling Wells Fargo express to and from the Comstock. The gold and silver it carried can probably be measured in the tons. It continued in regular service as long as the express train. It was upgraded through the years, including receiving electric lights in 1917. In 1925 the express train made its last run, but the car continued to see service in the replacement mixed passenger and freight train. In April 1925, the car was relettered Railway Express Agency. Change came in 1938, when express car No. 14 was part of the large sale of equipment to Paramount Pictures for use in the movie Union Pacific. In that movie, the car was intentionally wrecked in the Plum Creek massacre train wreck scene. It remained in Hollywood with one end broken open and propped up until December 8, 1971 when Short Line Enterprises acquired it and resold the car with a number of others to the State of Nevada. A wind storm in the early 1980s finished dismantling the car down to the frame, and it now awaits a full restoration back to its appearance in the glory days of the Comstock. Its sister, baggage-mail car No. 13, serves as the Chamber of Commerce in Virginia City. Photo #TK-180a from Grahame Hardy's studio. Shot was taken in Reno, Nevada on March 29th, 1935. Ahead of Car #14 is Car # 13 and behind it is Car #3. I don't know who took the photo, but I suspected it might have been Elmer E. Hosier since some of this collection has his name on them. Hosier was a Railfan Photographer in the 30s and 40s. He passed away in 1945 if I remember correctly. Though there are other photos I have from Tecrasilk that I know taken by others like Ted Wurm so your guess is going to be as good as mine. The printing on some of the photos states that they "May be reproduced when credit given to Tecrasilk."